This is a re-read of this novel. This is the first book in the OBSIDIAN AND BLOOD trilogy, but I am using this review as a review of the entire series as this is the last book in the series which I’ve reviewed on my blog. This series contains excellent setting. 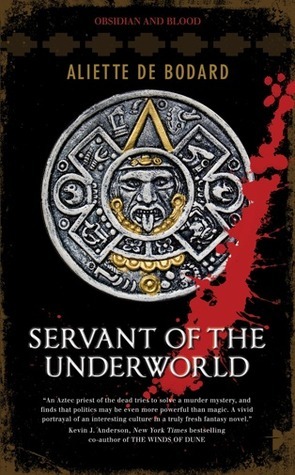 It is technically an Urban Fantasy novel, for the story takes place in the bustling city of pro-Columbus Mexico City (aka Tenotchitlan of the Mexica Empire). Warriors use obsidian and copper weapons, while fishermen and farmers both use boats to get around town. The magic system is strong, based on the Aztec gods and blood sacrifice, but it’s not in-your-face like some of Sanderson’s systems. The author does a good job of bringing Stone-Age Mexico to life. The characters are strong. Acatl the priest is an entertaining protagonist to follow, wielding death magic to maintain the boundaries of the Fifth World and prevent the world’s destruction from eldritch star demons and angry gods. He is consistent in his opinions and beliefs, but he has his flaws and neuroses. The other characters are similarly strong. However, none of them are what I’d call super memorable: this book contains no Kvoth, or Fitz, or Hermione, or Wax/Wayne, or Ista, or Ammar/Rodrigo. In short, the characters are good but not fascinating. The books’ plots are strong, but not super strong. They are mystery stories, with the main characters having to puzzle out murder mysteries in order to save the world. The books’ pacing is a bit iffy. The author doesn’t quite have the knack of writing pulse-pounding mystery stories. And that’s what this book is trying to be, a fast paced story. As a result the books have many slow patches. The book was good, but it would have been better if it were shorter. Net total, I recommend this series. It is not a series for everyone, but I think that if you are a fan of Urban Fantasy or Mystery books you should at least give this book a whirl. Who’s up for a swim in Chalchiutlicue’s waters?